Ronald Koeman felt Everton deserved their draw at Brighton this afternoon after Wayne Rooney equalised with a last-minute penalty. 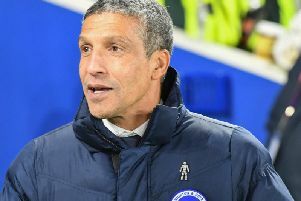 Anthony Knockaert gave Albion the lead on 81 minutes but Rooney equalised from the spot on 89 minutes after Bruno fouled Dominic Calvert-Lewin. The visitors then almost snatched all three points in the fourth minute of injury-time but Mathew Ryan produced a superb double save. Koeman said: "I think we deserved something out of this afternoon. We started well the first 25 to 30 minutes and the team did well. "We controlled the game and we defended well the direct play of Brighton. After half-time, again we started well but Brighton were dangerous in several situations and one poor defensive moment (Brighton's goal), when we tried to block and not block the ball - first by Dominic, stay on your feet, don't go down and the same for Morgan (Schneiderlin) in the second situation. "After that, we were lucky they didn't score a second. It was a game both teams played and fought for the win. "Maybe there was a earlier penalty situation with (Gylfi) Sigurdsson at 0-0. After that, okay 1-1. Maybe we deserved more in the last second of the game and in life and in football, you need some luck. The last two shots were blocked by the goalkeeper and were great saves. "We know we can play better but the commitment and belief of the players today was really positive." Koeman went three at the back when Everton fell 1-0 down and said: "We took the risk to play three at the back at 1-0 down. By counter-attack, we knew they would get more space to be dangerous but we showed belief until the last second to get the best result out of today. "At least it's one point because that's what we deserved today." Koeman added Rooney showed his world-class quality to score the late spot-kick: "Taking penalties is not the most difficult job but this moment it was totally different, at 1-0 down. You need points and to keep your calmness in this situation, it's experience and world class."